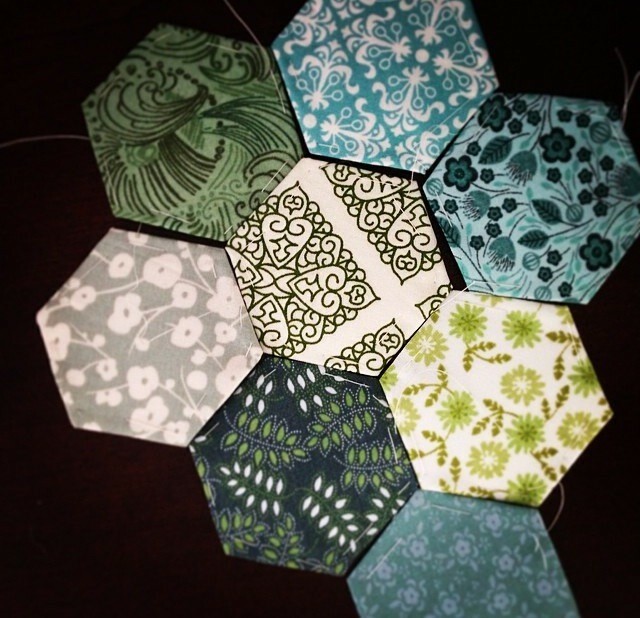 Down at the Flat I was wandering through some few of my favorite blogs a few weeks back and I read about Alicia Paulson of Posie Gets Cozy starting work on some fabric hexagons. It jogged a memory of my mother, an avid quilter, making hexagons when I was a girl and carefully hand stitching them together into a quilt top. Alicia’s hexagons were so pretty. Shades of pink and cream, green and blue. The combination of nostalgia and the twitchy fingers of my craft mania meant that it wouldn’t be long before I started some of my own. I’m an OK seamstress at best, but this seemed easy enough. I did a little research on construction and Florrie ordered us a few sets of paper hexagons online. We ended up with 1 1/2 inch and 2 inch paper hexagons. I was to go up to the Croakery for a long weekend and we were set to get started. While I was there we took a trip to JoAnn’s (which is extra exciting for me as we don’t have any of them down in the City) and we spent 20 minutes picking out fabrics. Initially I wanted aqua and browns, but the greens kept creeping in and the palette seemed to sort itself out. I bought a quarter of a yard of eight different fabrics, four green and four aqua of varying shades, patterns and intensities. I knew I wanted to make a small project (a quilt seemed a bit daunting to start in case it turned out making hexagons made my teeth squeak) so I settled on a pillow cover. Turns out making the hexagons is a quick, easy and pretty fun process. 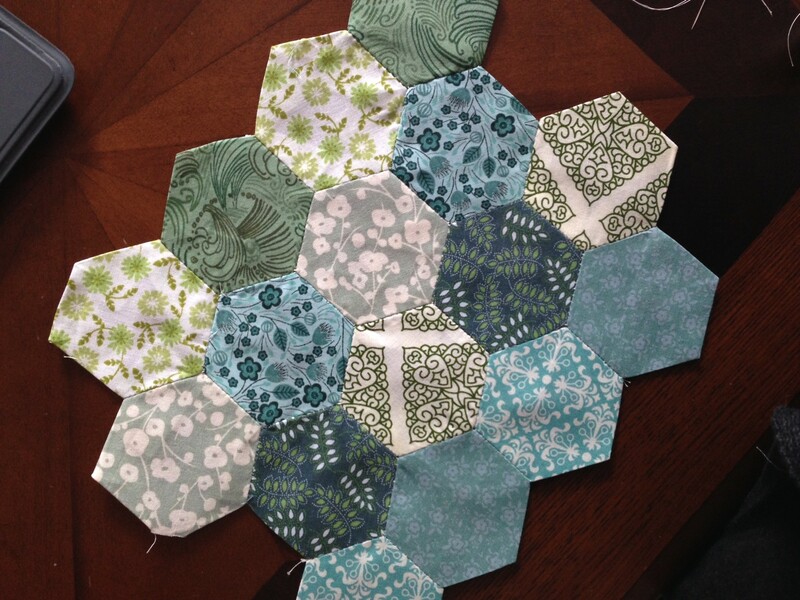 I cut out rough squares (why be fussy and cut a hexagon when you really don’t need to??) with my teeny Ginghers. You just need to make sure that your fabric squares are big enough to comfortably wrap around the paper pieces. Basting the fabric to the paper was quick and easy, soon I had a decent sized stack and started the work of composing my layout. I settled on diagonal stripes of a dark and light of each color, and laid them out to alternate green/aqua/green and so on. I thought the flower motif might be a bit too twee for what I had in mind. Stitching the hexes together turned out to be a breeze. The instructions said to use a whip stitch, but I somehow fell into blanket stitch and it seemed to be fine. I picked up a 20×13 inch pillow stuffer and got to work making my piece large enough to cover the front. I’m going to make the back with strips of the remaining fabric. That’s turning out so pretty! Are you handstitching the whole thing? Hi Gina! Yes, when I first heard that the hexagons were hand stitched my brain was desperately looking for a way to machine sew them, lol! But the hand stitching goes remarkably fast!! I’m amazed at how easy it really is, and I’m even considering making an actual quilt at some point.